Let the fresh air in, even when it’s raining. 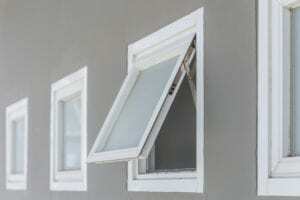 Awning windows are an excellent choice for those who want a versatile window option. Because they are hinged on the top and swing outward from the home, awning windows can remain open even during light rain without allowing precipitation to get into the house. Plus, they can be placed atop other window styles for added visual appeal and ventilation. For homeowners in Des Moines, there is no better company to turn to for awning windows than Home Solutions of Iowa. What Sets Our Windows Apart? Not only will you love your awning windows the day they are installed, but you will also be able to have exceptional peace of mind in your investment. That’s because our windows are backed by an incredible lifetime, non-prorated, transferable warranty, in addition to a lifetime material warranty from the manufacturer. To learn more about our awning windows or financing opportunities, contact Home Solutions of Iowa today. We will be happy to schedule a no-obligation consultation at your home in Des Moines or elsewhere in Iowa.